Cisco has launched a range of collaboration devices, including the 24in touchscreen DX80 (pictured), which features a built-in Android computer. The devices aim to reduce workspace clutter by integrating a phone, webcam, external display and audio equipment into a single unit. Cisco claimed its Android-based devices will simplify the workspace by dematerialising surplus technologies. Speaking at the supplier’s annual Cisco Live conference in San Francisco, senior vice-president and general manager of Cisco's collaboration technology group, Rowan Trollope, said these different communications technologies had not been designed to work together. "We’re tightly coupling the hardware and software to deliver an incredible experience,” he said. Trollope pointed out that the device is not a replacement for a computer, but is "the only thing you will need on your desk other than your computer”. The device is also said to improve video conferencing quality by removing the processing from the computer to an integrated device. “It’s super reliable in terms of the video quality. We built the processor into the device,” said Trollope. The hardware includes a built-in Cisco phone, webcam functionalities and audio, including four microphones strategically placed in the device’s legs. The microphones can hone in on the voice of the person sitting in front of the device and mute background audio, which Cisco said would suit open work environments. Cisco customers Dow Chemicals and Paras and Associates spoke out at Cisco Live about the supplier’s collaboration technologies. Dow Chemicals is using Cisco to grow globally in developing countries. Dow's global IT director, David Day, said multiple technologies which currently sit on the typical desk incur additional costs, but he believes he could roll out the DX80 around the world “without an operational headache”. Paras, a hosted video and voice call centre, uses Cisco’s platform to connect to hospitals across the US to provide an interpreter service. CEO Melinda Paras said the company bought into the video space because so much of communication is body language. “I got a sneak preview of the DX70, and myself and my team were stunned by the product. Small and inexpensive enough, we can imagine every nursing station in the US having one,” she said. Cisco said the device works with Microsoft Active Directory and can import contacts from mobile devices, Google and Apple. Trollope said just 7% of conference rooms in the world have some kind of video conferencing equipment, but most don’t have anything, primarily due to the expense. The DX80 will cost less than $2,000 when it hits the market later this year, and a miniature version – the DX70 – will be introduced for under $1,000. The smaller device boasts the same processor, memory and screen quality, but features a smaller 14in screen. Trollope also pointed out that all the different video conferencing and telepresence software on the market doesn’t work together either. 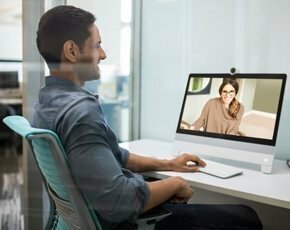 To address this problem, Cisco also announced a hosted service called Collaboration Meeting Room (CMR), which provides a personal meeting room that can be accessed instantly. Users of the CMR will be able to share a unique URL with up to 500 people who can then join meetings through any browser on a PC or Mac. It also supports Android, iOS and Windows Phone. The CMR service will be available through Cisco’s existing telepresence software partners later this year.